GPS - Where in the World Are We? Presented by Ben Valsler, Helen Scales. Where in the world am I? We're looking at the science of the Global Positioning System, or GPS, this week. We find out how satellites can tell you your location, as well as communicate with the bossy little box that tells you which way to drive. We discover the potential for "spoofing" GPS with a false location, and how this might be the future of cyber-terrorism as well as explore the cosmic reference frame that the satellites themselves rely on. In Kitchen Science, we get back to basics and locate ourselves using a map and compass! Plus, the first amphibian genome helps to fill the vertebrate family tree, we meet the colourful fish that shine a light on evolution and find out how a technique developed to study eye disease can help find art forgeries. 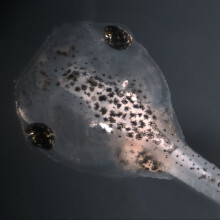 An analysis of the genome of the Western Clawed Frog, Xenopus tropicalis was published in the journal Science this week, marking the very first amphibian genome sequenced. Uffe Hellsten and colleagues at the Department of Energy Joint Genome Institute in Walnut Creek, report the finding that nearly 80% of genes associated with human diseases have their counterpart in the frog's genome - which has roughly the same number of protein coding genes as our own. The western clawed frog is particularly interesting for a number of reasons. Firstly, being the first amphibian to be sequenced it helps us to understand the full range of vertebrate genes - we've already got the rat, chicken, zebra fish and human genome, so we're filling a gap in the vertebrate family tree. Also, the world's amphibians are under threat at the moment, with populations in serious decline. This genome may help to understand some of the problems that amphibians currently face, and so give us clues as to how to prevent further losses. But the western clawed frog is more than just an example the class Amphibia - it's of particular interest to us because it's biologically similar to it's cousin, the African clawed frog or Xenopus laevis. The African clawed frog has been vital to our understanding of embryology since it was used for pregnancy testing back in the 40s. It has large, sturdy and easily manipulated eggs, and so it, and it's smaller relative the western clawed frog, rapidly became some of the most popular organisms in embryology. The frog's genome is remarkably similar to that of the chicken or our own in basic structure, for example, frog genes have very similar neighbours compare with human genes about 90% of the time. We last shared a common ancestor with frogs around 360 million years ago, but there are around 1700 genes in the frog genome that are very similar to disease-related human genes. Frogs are known to produce their own antibiotic compounds, to help keep their moist skin free from infection, and some of the genes responsible for this have already been identified. The researchers were surprised to see a very large proportion of mobile genetic elements, called transposons - accounting for about one third of the genome. These generally don't code for a protein, but are involved in controlling the way the genes work, including reorganising genes in the chromosomes. It will take more research to discover the real implications of this. This discovery will create new ways to look at human development and disease, as well as act as a scaffolding for sequencing the larger X. laevis genome. It will also help in the process of chromosomal archaeology - allowing us to piece together the story of vertebrate chromosomes, and how they developed into the incredible variety of species we see today. A group of colourful fish living on Caribbean coral reefs have shed light on how species evolve in the oceans. 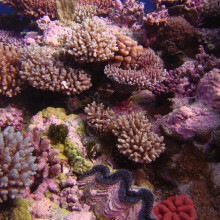 The seas brim with thousands of species but how they evolved remains something of a conundrum. Now researchers from the University of East Anglia, in the UK, and Simon Frazer University in Canada, have uncovered evidence suggesting fish can separate into new species without a geographical barrier - a rarity in the fluid, underwater world. With the help of hundreds of volunteer divers spotting fish in REEF surveys (Reef Environmental Education Foundation), the research team tracked the location of hamlet fish, from the genus Hypoplectrus, all across the Caribbean. These are small fish, around 15cm or 6 inches long, that come in a variety of colours including yellow, blue and black (one of my favourites is the indigo hamlet - a deep indigo colour with white bands that look like it's been tie dyed). Previously, it was thought that marine species might have evolved during times when the sea level was lower which split populations into separate water bodies. These subdivided populations would then have given rise to new species. This new study, published in the journal Global Ecology and Biogeography, revealed that hamlet species tend to live in a series of clusters or hotspots. If species evolved in isolation, we might expect to see separate hotspots for different species: the evolutionary cauldrons of the past. But instead, many species live in more than one hotspot and individual species hotspots overlap, suggesting that hamlets didn't evolve separately but in the same areas. It could be that other factors like competing for food and habitat are more important than geographical isolation in the story of how the hamlets evolved into different species. Now researchers need to work out what is controlling the current distribution of hamlets and uncover what is stopping them from interbreeding and blurring species boundaries. This study has put good scientific use to data collected by amateur scuba divers and the findings have provided at least part of the solution to the riddle of how some species in the oceans have evolved, and continue to do so. A technique developed to take three dimensional, real time images of the retina is also useful for detecting evidence of fraud in paintings, according to research published in the journal Accounts of Chemical Research this month. Piotr Targowski and colleagues at Nicolaus Copernicus Univeristy in Torun, Poland, realised that the technique of Optical Coherence Tomography, or OCT, should be able to image the layers of a painting, just as it does in biological tissue such as the retina. OCT can be thought of as the light version of ultrasound. A beam of light, usually at near infra-red wavelengths, is sent into a tissue, and the reflected light is collected. 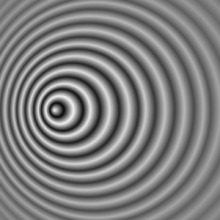 Much of the light is scattered, and so will not produce an image, but OCT filters this scattered light to produce an image much like ultrasound. It can produce a high resolution, three dimensional, real time image, though it doesn't penetrate very deeply into the tissue. Paintings are, usually, built up in layers. The very back of the painting will be the canvas itself, but the artist will often apply a layer of adhesive to this, to make sure future layers stick properly. You may then get a primer layer, an outine, various layers of coloured paint, or semitransparent glaze, and then a protective varnish. Clearly, each layer will be incredibly thin, but this is where the high resolution of OCT comes into it's own. It's important for conservation purposes to understand the stratigraphy of a painting, and the most common way to do this is to cut a sample of the paining away, embed it in resin and observe it under a microscope. OCT allows you do image all of the layers without even touching the painting, down to the micrometer level. Yes. 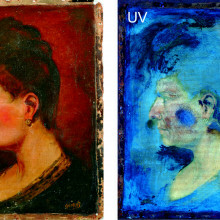 By imaging all of the layers on a painting, you can easily see where something has been painted over, or added at a later date. An example given in the paper is of a painting of St Leonard, a Franciscan monk in painted in 1797. The painting bears the inscription "St Leonard" in one corner, but as he wasn't beatified until 1867, either the inscription or the date must be wrong. Using OCT they could show that the layer containing the date was part of the deep structure of the painting, while the inscription of "St Leonard" lies on top of the thick coat of varnish that covers the original black background. They could also identify an earlier inscription, which must have been painted over when Leonard was canonised. This same technique could be used to spot less well meaning alterations! The world is still loosing biodiversity at an alarming rate despite world leaders promising in 2002 to cut the rate of loss by 2010. That's the stark warning from a paper published in the journal Science this week by a large team of international researchers. Together they pooled data from the past four decades on 31 "indicators" of the state and pressures on biodiversity and found no signs of improvement but many of continued breakdown of species, populations and ecosystems as well as unrelenting impacts from human activities. 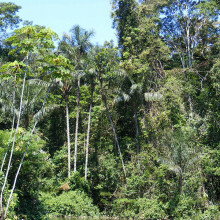 It means that the Convention on Biological Diversity (CBD), which meets later this year, will fall a long way short of it's intended targets.Especially worrying is that these indicators were set by the CBC specifically to measure the success of this global pledge and include a wide variety of things including the area and health of various habitats like seagrasses, forests and coral reefs, the number of overexploited fish stocks, the number of endangered species, and water quality. There is some good news though, with increases in the number of protected areas - although we still need many more - and commitment to tackling invasive species. There are also a few cases demonstrating that where there is political will and necessary money, biodiversity loss can be reduced or reversed. This finding probably comes as no great surprise. We hear so much of the ongoing problems faced by the natural world, it was hardly likely that this study would paint anything except a fairy dismal picture. So why do we need studies like this?This was a huge study with a vast amount of information squeezed together to provide a short, sharp message. There's no hiding from it: we are still loosing biodiversity.Some people argue that we loose a lot of important detail in sweeping studies like this, but it is the sort of thing that will capture international attention, in particular politicians and decision makers. With so much data all pointing in the same direction, no one can deny that there is still a big problem and action must be taken to tackle it especially since it is widely recognised that biodiversity loss has a major impact on human health.There have been major advances in how scientists use indicators of planetary health like these, although this study highlights that we still know most about certain animals in certain parts of the world, with major gaps in knowledge still getting in the way of a complete picture. Hopefully this study will stimulate world leaders to start setting out tough new plans for reversing the downward spiral of global biodiversity and help make sure that next time we stick to our promises. Ben - Also in the news this week, the Lancet has published a full clinical assessment of the benefits of looking at your genome to help personalise your medicine. Dr. Euan Ashley from Stanford University School of Medicine joins us now. Hi, Euan. Thanks for joining us. Haven't we been finding genes related to disease for years? What's actually new here? Euan - Well, thanks very much for having me on the show. I think this is the first time that anyone has really had a whole genome available for an individual. The task we set ourselves was - what if a patient comes in to a doctor's office with his or her whole genome, what will the physician be able to do? So we tried to integrate all the associations with genes and disease that have ever been described in a way that we could apply to this one person's genome. Ben - And is it just the diseases that we can look at or can also tell a bit about how they might respond to certain drugs? Euan - Yeah. This is the topic of so-called pharmacogenomics, using the genome to help try to choose a better drug and personalise medicine for the individual. But it can do other things other than just choose the best drug. It can do that on the basis of the best effect for the drug but also hopefully, help to avoid side effects. In the particular patient in our paper, he fell just short on the regular criteria for recommendation of cholesterol lowering medication. But when we looked into this genome, we found increased genetic risk for coronary artery disease, so we moved ourselves towards recommending that. We looked in the genome to see whether he would respond well to one of those cholesterol lowering meds and then we found variance in his genome that would suggest he would. And more than that, we actually found variance that suggested a low risk of side effects and I think this is really what 'personalised medicine' of the future will begin to look like. Ben - We've had a sequence of the human genome for a little while now. Why only now are we starting to look at it from this personalised medicine perspective? Euan - Well, I think that the informatics challenge has been very significant and of course, all the time, this information is changing and we're gathering together information about new variants. This was only the 5th human genome that has ever been sequenced and really, it's only a few years ago that it cost millions of dollars. In fact, in 2001, when the first draft Human Genome Sequence came out, that project was $3 billion, although maybe 3 or 400 million were the sequencing cost. But this particular genome we looked at cost only $50,000 to sequence and even since we did that last year, the cost has fallen in half and we believe it will continue to fall so that in the next few years, it's really literally a few hundred dollars. Ben - So that sounds very promising. I'm glad to see it's getting a lot cheaper but how do you prepare somebody for this? You're telling them an awful lot of stuff that they won't have known about themselves, about their risk for diseases. Does somebody need counselling in order to actually take all this in? Euan - Absolutely and this is something that we took very seriously. We did provide counselling to this particular patient. I think it's a challenge really in a quantitative way. We've always given genetic counselling to patients when we do genetic testing but this is really on a whole different scale. They could potentially find out about hundreds or thousands of disease risks and we need to make sure that patients and physicians are going ahead in a way that their eyes are open and that they understand what they might find out. This is - at the end of the day, not a cholesterol test where you might find out four or five things. 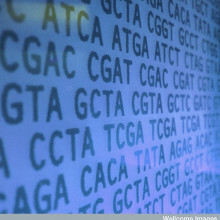 You're dealing with 6 billion data points and really maybe, 2 ½ million variations from a reference genome. And so, there's going to be a lot of information and it's going to be a lot to take in, and I think we have to take that part of it very seriously. Ben - So what are the challenges for you now? What's the next step? Euan - Well, in the original paper with this genome, there were there three authors and they sequenced the genome for $50,000 in five days, and the paper that just came out in the Lancet this week, there were 30 authors and it took us months and months, many hours of manual labour to comb through this genome. And I think what we would like to be able to do is automate that and many of the algorithms that we have written are easily and readily automated, and we started to work on that for the next genomes that are coming forward. Ben - So the sequencing is getting very quick but it's this analysis that we've really got to speed up. Thank you ever so much for joining us, Euan. That was Dr Euan Ashley from Stanford University on what could be the future of personalised medicine. How does the GPS in your car actually work? And what does the future hold for GPS? Meera went to meet Dr Chaz Dixon and Colin Lee to find out more. 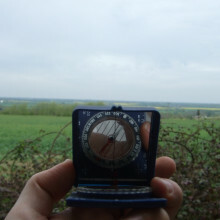 Meera: - This week I'm on a mission to find out how the Global Positioning System, or GPS actually works. My first stop is European space company, E.A.D.S. Astrium down in Portsmouth and with me here is Dr Chaz Dixon, Head of Future Programmes Navigation. Let's kick things off with, what is GPS? Chaz: - Most people will be aware of GPS through things like their in-car sat navs. Sitting behind that is a constellation of 24 satellites. They were created by the U.S. military and through the generosity of the U.S. tax payer, there is a civilian service released worldwide for essentially free use for the rest of the world. Meera: - How does it actually work in order for the people relying on it to know where they are in the world? Chaz: - To understand this, we have to realise what "where you are" means. We don't know where we are on a map. We typically don't know what our height is either. So we have three uncertainties: our position in latitude, longitude and height. From the satellites - each of which has a precisely known location based on its ephemeris which is a data set telling you where it is - we can take a ranging measurement. We now know our range from a satellite at a precisely known location. That gives us this sphere of positions. If we then take measurements from two and three satellites, we now have the intercept of two and three spheres which intercept at a single point which is the user's derived position. Unfortunately, it's fractionally more difficult than that because the measurements are timing measurements. We have to measure our position relative to the satellite transmitted time. That means we have to make our fourth measurement to solve for our local time relative to system time. So the satellite includes data that lets us know the time of transmission. If we then measure the time of reception, speed of light being constant, then we know the distance. So four measurements gives you user position, and coincidentally for most people, time as well. Meera: - Now, as you've mentioned, GPS is a US system and Galileo is a European version which is in production at the moment, and is hoped to be in operation by 2014. The actual navigation components of Galileo are being made here at Astrium. Chaz: - That's exactly right. Galileo comprises 27 satellites baseline plus three operational spares which means that the user will see 30 transmitting space craft. Here in Portsmouth, we only deal with the nav part, with the payload. The reason for the constellation is essentially to augment the GPS coverage. To make GPS and Galileo truly compatible and therefore, the problems you see with the famous urban canyon where you may lose GPS coverage will be a thing of the past. Meera: - This will hopefully result in more accuracy as well. Chaz: - More accuracy and even more significantly more availability. Meera: - What's the current accuracy of GPS? Chaz: - The accuracy the people will see is typically five metres. Meera: - Now this ability to position yourself globally is extremely important today. How important would you say this technology has become? Chaz: - Really, it's been revolutionary and obviously the thing that many people will be familiar with is in-car sat nav. On the back of that are commercial fleet management systems, another interesting community is aviation, immensely increasing the accuracy of positioning. And another interesting community is the survey community who have much more demanding needs in terms of the accuracy that lets them do ultra precise positioning for trigger points for buildings, for oil exploration et cetera that never existed in the past. ...I've now come down to Southampton, to the headquarters of satellite navigation company Garmin, to see some GPS devices in action. With me is Colin Lee, product manager here at Garmin. Colin, we're inside your car and you've got a lot of sat navs set up inside this car. How do these actually work in order to get us to our destination? Colin: - Well basically, these are multichannel receivers which receive radio waves from the satellites that are orbiting above us. They all beam a signal at the same time, telling us the position of where they are and also, the delay when they come down to us. We can then determine where we are in relationship with them. Meera: - So now, we're going for a drive in order to see theis sat nav in action. So where are we going? Colin: - We're going to the Southampton Maritime Museum. GPS Audio - "Please drive to highlighted route..."
Meera: - How is this working, Colin, in order to just know that we're exactly on this road and that we're heading in the right direction towards the Maritime Museum? GPS Audio - "Turn left..."
Colin: - The satellites are beaming their position and location so we can then plot that data onto a map which is inside the unit - latitude and longitude positioning. So we take that data, we then put that data onto a map and we then show that on a graphic display so you can see where you are, in relationship to the satellites. Meera: - It's quite clear roads here actually. So it looks like it will be quite a pleasant journey getting there, but if it were rush hour, how would the traffic predictions within these sat navs work in order to help you find a quicker route home? Colin: - We've got two types of way you can deal with traffic. One of them is the live traffic that comes off with these sensors next to the road which then get sent back via fm signals to the car; and the other way doing it is you have data - historic data which we can refer to so we can avoid things like road blocks and so on. Meera: - And what about if signals are suddenly lost? What could happen in order for you not receive a GPS signal anymore? Colin: - The signal is the same as any radio signal and any radio signal could be affected by rain, it could be affected by buildings, and so, if you're in a forest where it's been raining, then it could affect your signal. If you're between buildings in London or something like that, then the reflections from the buildings can cancel signals. But as soon as you come out of that area, it's only a small area normally, then the signals come back to normal and you're up and running. GPS Audio - "Turn left on Bugle Street..."
Meera - Oh! And we've reached our destination then. That didn't take very long. GPS Audio - "Arriving at Southampton Maritime Museum on right..."
Meera: - Now what could be coming up in the future of this technology in order to make journeys like that even smoother? Colin: - We'll try to get better accuracy by using the Galileo system which is going to be all over Europe soon. We will try to personalise sat navs more, learn more about you and your car, and we'll be looking more into the environment. We'll be improving 3D technology so it makes it easy for you to see your environment around you. And by the way, the reason why I brought you to the Maritime Museum is because 100 years ago, they used sextants and stars to actually navigate whereas today, you're in my car using a sat nav, using satellites instead of stars. Helen: - GPS certainly is changing all our lives - I'm thinking about getting a satellite navigation system for my bicycle. That was Colin Lee, from Garmin, they are one of the many manufacturers of satellite navigation systems, and before that was Chaz Dixon, E.A.D.S. Astrium talking to Meera about the science behind the latest in positioning and satellite navigation. Helen - We've already heard from Meera how we can end up getting lost if you don't keep the maps in your sat nav updated, but GPS is potentially susceptible to something a lot more sinister. It can actually be intentionally fooled. Professor Todd Humphreys is from the University of Texas in Austin, and he joins us now. Thanks for joining us on the Naked Scientists. Todd - Hi, Helen. Nice to be here. Helen - Now first of all, what are we talking about here? We're calling this "spoofing" of GPS. What's that all about? Todd - Well, it's that the GPS signals that civilians have access to are not secure signals and that means that they don't have any encryption or authentication. So there's no way for you or me to know for sure where they originate. They might be coming from the satellites, that's the most likely scenario, but they could also nowadays be coming from someone who is generating counterfeit signals. Helen - So counterfeit signals is something that we should be worrying about? Is this happening already? Todd - It's not something that's happening as far as we know except in some controlled experiments. But the incentives are building. There are places now charging road charges based on your GPS positioning and fisheries are managing fleets by GPS positioning. People are put under house arrest with GPS ankle bracelets. And so, the incentives are building for some hacker to mislead you into thinking that you are actually in South London when you're in North London. Helen - So this sounds to me a little bit like when we had computers and we didn't yet know anything about computer viruses. Almost that there's a potential for someone to come along and mess around with the GPS and potentially cause some problems. But so far, we're okay and the idea is that we should be pre-empting those problems. Todd - That's right and the analogy with computers is a good one. There was a time, perhaps 20 years ago or more when we didn't have to worry about computer security. But that time has passed and now we're realising that we must also pay attention to navigation and timing security. Think of it like the story from the Little Red Riding Hood when the big bad wolf came in and devoured little red riding hood's grandmother and then dressed in her clothes and adopted a fake voice. It was good enough to convince little red riding hood to come in to the house and that's what we call GPS "spoofing" when we impersonate or counterfeit these GPS signals so cleanly that you can't distinguish them from the authentic signals. Helen - And you've been doing research into how you might become the wolf? How you might actually produce these spoof signals? Can you tell us something about how you go about doing that and how spoofing works? Todd - Sure. Well first of all, some justification. There were some government reports here in the US, warning about the possibility of spoofing attacks maybe a decade ago, but there was very little information about what a sophisticated attack would look like. And so, some researchers and I came to conclude that we couldn't just speculate about how to defend against an attack. We'd have to go through the exercise of building a spoofer in order to come understand more intimately the signatures left behind by attack. So a team of us from Cornell University and Virginia Tech looked over some early defences that had been proposed and we concluded they were weak and we figured a way to circumvent almost all of them. So we took the next step and decided that we've had to develop a sophisticated spoofer ourselves and in truth, it only took us about 3 months and we had a portable spoofer that could align its signals with the authentic signals. We've tested it against iPhones and Garmins and just any receiver that we've tested it against, it has successfully duped into thinking that it's some other place or some other time. Helen - What sort of range are we talking here? How far away can you dupe an iPhone or a GPS unit? Todd - Well the range we've used is close proximity. That makes it easiest. That way, you don't have to figure out your relative position between you and the target, but you can theoretically spoof from a distance as long as you know a three-dimensional vector between you and the target. Helen - And the sort of devices that you've come up with, presumably they could be sneaked onto an airplane perhaps and then start causing trouble from up there? Todd - Well, we don't want to get into doomsday scenarios but that's definitely a possibility. And so, we're working hard to come up with defences against spoofing so that one can detect an attack. Say, you can detect that if the big bad wolf's pointy ears are sticking out then it doesn't look quite like grandma. Helen - Absolutely and presumably you're not doing this research because you want to spoof. You want to figure out how to stop this from happening. So how do we go about detecting if this started to happen and what can we do to try and stop it? Todd - Well, like I said, there are signatures that are left behind by anything but the most sophisticated spoofers. So if a juvenile attack is mounted, you can almost always tell that something's wrong. Unfortunately, with the sophisticated type spoofers that we've developed, you leave behind very little clues that you're under attack. And so, it turns out that only cryptographic methods are really robust against spoofing and we're trying to develop cryptographic methods to piggy back on the military signals which are themselves encrypted. And in fact, we're trying to convince US authorities and Galileo authorities to make sure that the public has access to encrypted civilian signals. Helen - Okay, let's say that this does start to happen and this at one point does become some sort of a threat. We have our computers and we can install anti-virus software onto our computers. Are we going to be able to do eventually something similar, do you think, can we retro-fit our hand units or satellite navigation systems, or are we going to have to really start again with something new? Todd - You probably won't be able to retrofit existing devices but we're developing devices, software based GPS receivers, they could be retro-fit, and we're developing techniques that could be employed in those receivers to act as anti-virus software acts against computer viruses. They've actually been very effective in our tests in the laboratory and what we can show is that while we can't prevent spoofing completely, what we can do is make it very challenging for a "would-be" spoofer to mount a successful attack. Helen - That's fantastic. Well thank you very much. That was Todd Humphreys from the University of Texas, giving us an idea about how GPS units can be duped with fake signals and leave us in the wrong position, and not where we thought we were! 39:19 - Will an increase in GPS tech mean more satellites? Will an increase in GPS tech mean more satellites? More people using GPS won't require more satellites, just like more radio listeners doesn't mean you need more radio transmitters, or more bums on seats in an auditorium doesn't mean you need more members in an orchestra. However, there will soon be more positioning systems, when the Galileo constellation launches. Galileo is an EU/ESA project to enhance and back up GPS. 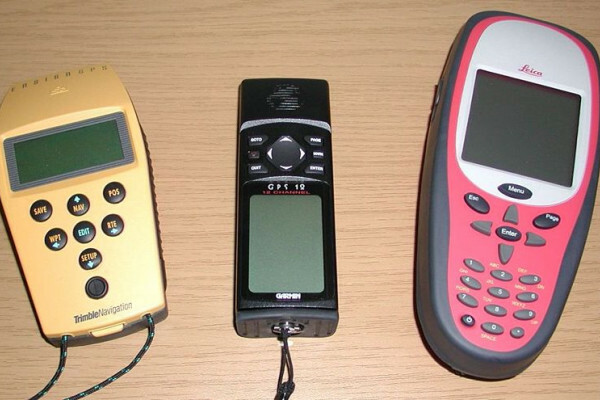 Chopo - If you want to get information from the satellites you need to know where the satellites are and so that applies whether it's a GPS satellite or an altimetric satellite from which you're trying to find the height of the sea surface. Ben - What options do we have? What reference frames could we possibly use for satellites? Chopo - Well, the satellites can define their own reference frame if you have accurate tracking. But the reference frame of satellites is dependent on knowing their orbit and not everything about an orbit of a satellite can be derived. Ben - So, the most obvious option to me would be that we have bases on earth, we know where they are, and we can use those to triangulate where a satellite is. Is that a viable option? Chopo - Well, that's a viable option but of course, to know where you are on the earth, you have to know where the earth is. And in fact, it is a coupled problem of how to define an accurate terrestrial reference frame and an accurate celestial reference frame and in fact, the angle between these two which is the orientation of the earth has to be measured. There's no way of modelling it. Ben - So, can we therefore look at the other local objects? So we look at the sun, look at the moon, look at the planets, and use that as our reference frame? Chopo - The sun and the planets are not necessarily the easiest things to observe; the sun because it's rather large and the planets because there are not very many of them. What has been used in the past are the stars and the sky, and that served this purpose for many centuries. Ben - So we're looking at the stars that we can see obviously. How do we actually use them to compile a reference frame? Chopo - What was necessary was to observe the stars over some period of time and relate those positions to positions on the earth, and also to look at the relative positions of stars. But the difficulty with stars in the medium regime is that they also move. So, in addition to knowing their position, you need to know their velocities and this takes observations over quite a long period of time. Ben - So, what are our other options? What else can we use? Chopo - Well, what the astronomical community decided to do in the 1980s was to go to objects which are not moving and the simplest objects at least conceptually are those objects that are so far away that they actually can be considered fixed points in the sky. And so, these are objects that are completely outside the Milky Way. Ben - So what are the objects we're actually looking at? Chopo - The objects we are looking at now are radio sources. Mostly quasars which are billions of light years away and they are so distant that geometrically, you could not expect to be able to detect transfer motion, that is motion across the sky. Ben - And how are these actually measured? Chopo - We use large radio telescopes that are mostly 20-metre in diameter and we use a network of stations which basically cover the globe. It is necessary to have a large network because the angular resolution with which we can measure the positions depends on the physical size of the network. If we were limited to a single radio telescope, the accuracy of the positions of quasars would not be achievable at the level we need. Ben - So essentially, this reference frame acts as a sort of GPS for things like GPS satellites. How have we improved it since we first came up with it? Chopo - The extragalactic reference frame dates from the middle to late 1990s and the way we have improved it is to make more observations, to improve the positions of the sources that we have then, and to add quite a few more sources, quasars, to the list of objects for which we have good astrometric positions. Ben - How many have we got now? Chopo - The total catalogue whose positions are listed is about 3,000. So, in the count of celestial objects, this is really a drop in the bucket but the advantage is that the positions of these objects are known so much better than the positions of stars derived optically. Ben - And so, what's the next stage for you? How are we going to make this even better? Chopo - The project that the astronomical community is waiting on is a satellite project called Gaia which is scheduled to go up in 2011 or 2012. This satellite will be able to see the extragalactic objects, the quasars in the optical, and the hope is that the frame can be extended to hundreds and thousands of objects because there are many more quasars that have been detected in the optical than can be used in the radio. 46:20 - How popular is GPS for finding your car keys or remote control? How popular is GPS for finding your car keys or remote control? I've not heard about GPS isn't the best technology for this sort of application, as it doesn't penetrate too well inside buildings. 46:50 - Can divers use GPS whilst underwater to navigate through the water? Can divers use GPS whilst underwater to navigate through the water? We put this to Professor Todd Humphreys: Todd - Divers can't use GPS. It's because the high radio frequencies used for GPS just bounce off the surface of water. And so, divers will have to resort to other means - sonar or other techniques - for navigating beneath the water surface. Ben - Helen, you're a regular diver. How do you find out where you are? Helen - Well, we have used GPS when I've been doing things like underwater surveys. 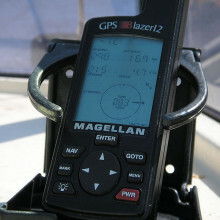 What you can do is tie the GPS to a buoy on the surface and drag it along behind you. Then you can download basically where you've been. You can track your path and match that up with what you were looking at when you were underwater. 47:43 - Why do we use satellites for positioning instead of ground based methods? Why do we use satellites for positioning instead of ground based methods? Todd - Well in fact, the early systems were ground based. There was the LORAN (LOng RAnge Navigation) system developed around the second World War that worked faithfully for many years and is still in use in some parts of the world. The trouble is that GPS enjoys great advantages over these ground based systems. It's got global coverage and its signals aren't distorted by the local topography. So it's just been a question of success. GPS has line of sight global signals. 48:20 - Can the US limit GPS? Can the US limit GPS? Todd - Well, it's important to recognize that the US has a strong incentive to ensure that GPS is reliable, and that's because a good deal of the world economy depends critically on GPS, especially for timing. So, any military initiated or US initiated denial of civilian GPS would most likely be a surgical pinpoint denial in some military area of operations. It's possible but it's very unlikely because the US has such a strong incentive to make sure everybody understands GPS can be counted on. Ben - As a blanket thing doesn't civilian GPS only work up to a certain altitude? Todd - Well yes. 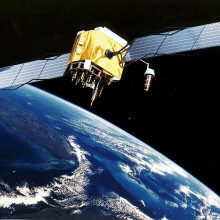 Civilian GPS receivers are required to carry inside themselves certain checks against going too fast and going too high so that in the case that they were strapped to some intercontinental ballistic missile, they would fail to work. So that's one way that the US is trying to prevent unauthorised use of GPS in a various purposes. Ben - But obviously, assuming we're not strapped to an intercontinental ballistic missile, we can still use it to find out where we are to go treasure hunting and to make sure we know where we are on a map. Todd - That's right. All of those good activities! 49:52 - Does music radio get doppler shifted? If you're driving towards a radio mast - does the music you're listening to get doppler shifted? Would there be a difference in the tone or tempo? Does music radio get doppler shifted? I think the question is quite subtle and actually has three parts to it. The first part of the question is very straightforward - do radio waves exhibit the Doppler effect? And they certainly do. And anyone who's been caught speeding by a policeman using a microwave speed gun certainly knows that that's the case. The police speed gun uses the Doppler effect to determine your speed relative to the police car. The second part of the question is if I now encode some audio information on the radio wave, does the Doppler effect get imparted on to the radio signal? That's much more subtle and needs thinking about carefully. Basically, the question is - let's say, I have a radio program like Radio 3 playing an oboe and the oboe is playing a perfect A, if I put my radio to my ear and move towards the transmitter at high speed, do I expect to hear the oboe's note increase? The answer is closely related to the way in which the amplitude signal is encoded onto the radio signal and it can be done in two ways. Traditionally, amplitude modulation (AM) was used and this is where the audio information is encoded on the radio signal by modulation of the amplitude of the radio signal, more laterly people use frequency modulation and that the audio signal is encoded in the form of the frequency of the transmitted wave. And it can be shown through some rather delicate arguments that in both of those cases, in fact the audio signal does take on the Doppler effect. So in other words, you would expect the oboe's note to change by some very small amount. Diana - But how small will these differences be? Stafford - The third part of the answer however is whether the effect is detectable and the problem is that when you derive the appropriate equations and put the numbers into the equations, what you find is that for an audio signal, the shift in frequency is exceedingly small. So, even if I was to put a radio to my ear then move towards the transmitter at something like 10 metres per second, then you can show very simply that the shift in frequency of the audio signal would be of the order of thousands of a Hertz. And I'm afraid that the average radio receiver and indeed human hearing is not good enough to detect those changes, but it would be possible and in fact, quite straightforward to build an instrument which would detect that change. The digital case is rather different again because the audio information is encoded in a very complicated way and so, the coupling between the listener and the radio wave that originally transported the information to the listener's home, that coupling is a very, very weak one. There's all sorts of electronics between those two stages in the process. And so, a digital signal will not display the Doppler effect. Next Comets, Planets and Space!